Platinum Alton Solar Potting Wooden Sheds. Choose Cladding..19mm (15mm finish) T&G ShiplapLoglap Cladding for 7x5Loglap Cladding for 8x6Loglap Cladding for 10x6Loglap Cladding for 12x6Loglap Cladding for 9x7Loglap Cladding for 8x8Loglap Cladding for 10x8Loglap Cladding for 12x8Weatherboard? Please Ask For Quote. It’s always good to make use of your garden and you can’t beat the beautiful taste of fresh produce from YOUR garden so a solar potting shed is a good investment. 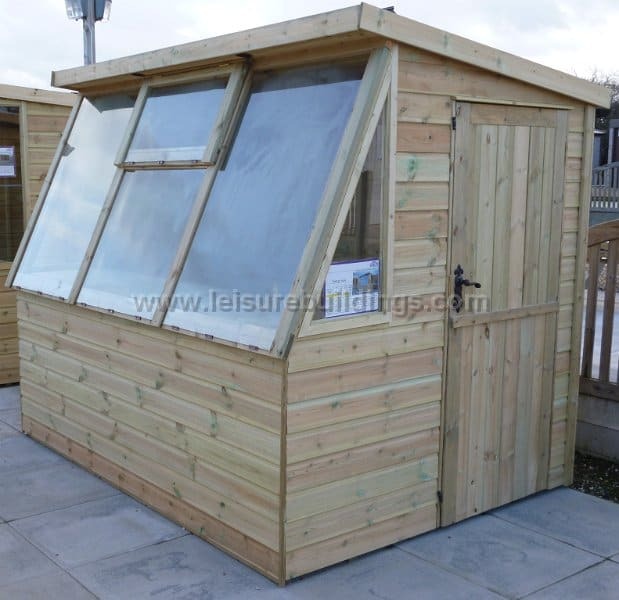 However, you need to be a little careful in your choice to ensure you won’t be disappointed as there are many ‘cheap’ sheds available there for you to choose from. It’s often easy to choose on price but this can be a false economy. A cheap potting shed will be made from cheaper, often unsuitable, materials and is likely to have horticultural glass or plastic for the windows. These Platinum potting sheds are made to last and to make you feel proud of them. Based on the same principles of the ‘high end’ Supreme workshops they are built to last. The attention to detail is staggering and include brass hinges and a five lever mortice lock on the stable door, supplied as standard. There is diagonal bracing in all corners and the building is screwed together. There is a really great bench for working on and an opening window for ventilation. The cladding, floor and framing are fully pressure treated for long life and is all timber, NO OSB board or ‘sheet’ materials on these buildings. All of these features ensure the very best for your garden. You can choose from thick 15mm (finished thickness) shiplap or 19mm (finished thickness) loglap redwood T&G cladding for your potting shed. The floor is solidly constructed from 19mm (15mm finish) timber and the roof is 16mm (12mm finish) roof covered with a heavy-duty polyester felt, but you can upgrade to Onduline if you choose. The timber itself is solid long lasting redwood timber, not the cheaper inferior whitewood used on most potting sheds, and the walls, framing and floor are fully pressure treated with 15 years design life against rotting. Vitally important on a building like this is toughened glass for safety and this is standard. Unlike many of our competitors who use cheap horticultural glass, which is highly dangerous if it breaks, or cheap plastic which flexes and is noisy in the wind. Toughened glass is the correct choice where you have young children in the garden playing. Further enhancing the qualities is the screwed framework. Again attention to detail. There is a standard range of sizes available which will suit most situations and gardens, however, if these don’t meet your needs or you would like something different then just give us a call and ask the question. If it is at all possible then we will endeavour to help. Well worth considering if you like these potting sheds but want something a little different. Don’t be afraid to ask and NEVER settle for second best. It’s always a good idea, where ever possible, to view your potential potting shed beforehand. We do have the solar potting shed on display as well as several of the Platinum Garden Workshops on view. By taking a look at these you will be able to see the high attention to detail which goes into the Platinum range of building, hopefully, giving you a good opinion of what you are likely to get. They are situated near Guildford and Farnham and has a largish display. By taking a look, at least at similar buildings from the manufacturer, you can get a feel for the quality which you can never get from a brochure or computer screen. As far as other web sites are concerned which don’t offer an opportunity to view the question to ask yourself is WHY?? In addition to the great features of these solar potting sheds we will assemble them in your garden onto your solid, level prepared base at no charge. This will save you a lot of hard work and time. You can also be sure that they have been assembled correctly which is crucial of these type of buildings. Does that have to be good for you? Many potting shed suppliers say it’s easy to build (mainly because they don’t offer that option) but don’t take the risk. It’s easy to be wise after the event and you don’t want problems afterwards do you? If it has been erected correctly then it will withstand all that ‘Mother Nature’ throws at it. However, if you really want to erect it yourself then we can offer a discount off our list prices. There are many ‘dodgy’ companies out there trying to rip off unwary people so it best to be a little careful. There are, of course, more good than bad in this business so how can you tell. The length of time in business and customers feedback is always a good indicator. At 1st Choice Leisure Buildings, a family firm, we have been involved in the garden buildings business since 1979 (and before Maggie Thatcher). We have always try to progress as well and in 1996 (before Google) were the 1st garden building company to sell on the Internet. So we are not stuck in the ‘dark ages’. You can also see customer feedback on this independent feedback site. By taking a look at customers feedback you can get a good feel for what we are like as a family business. Hopefully you will make THAT decision. Sizes: Solar Apex potting sheds available in sizes from 6 x 4 up to 12 x 8 as standard in traditional potting shed style. Longer lengths available. Cladding: Available in two thickness of claddings – 19mm (15mm finished thickness) T&G Shiplap OR 22mm (20mm finished thickness) T&G Loglap. (Redwood deal not the cheaper whitewood). Tanalised timber for long life. Screwed construction. Vertical Framing: 44 x 34mm (2″ x 1½” nominal) planed and rounded timber as standard. Effectively thicker in corners when erected. Roofs: 16mm (12mm finished thickness) T&G timber and covered with heavy polyester roofing felt. NO chipboard, plywood, OSB, sterling board or sheet materials as these are unsuitable for outdoor use and which you would find on cheap potting sheds. Option for Onduline roof. Floors: Extra thick 19mm (15mm finished thickness) T&G boards. Pressure treated 44 x 34mm (2×1½ nominal) pressure impregnated floor joists for long life. NO chipboard, plywood, OSB or sterling board as these are unsuitable for outdoor use. Doors: Stable Doors, 44mm thick, and fully braced. Shed doors normally hinged towards the low side of the shed. Size: 5′ 10″ x 2′ 6″ wide. Supplied with a five lever mortice lock and brass hinges. Beware of doors with NO bracing. Staging: Solid Timber bench-staging is included as standard underneath the front windows. Windows: Windows on front high side and both ends (triangular). Included as standard is at least one opening shed window. Clear TOUGHENED glass bedded in clear silicone. NOT cheap horticultural, plastic, or scratchable perspex. Corner Strips: ‘Wrap Around’ corner strips for extra protection to the end grain of the timber on these traditional solar potting sheds and for a smarter finish. Treatment: Tanalised pressure treatment for long life is used as standard on the workshops walls, framing and floors. 15 years design life against rotting. Although the timber is protected against rotting it’s important that you apply a coat of waterproof treatment within 3 months of delivery to ensure the fullest life for your new building. Fittings: These are all rust resistant or galvanised to ensure long lasting good appearance to your workshop. NO staples are used as these are not suitable for a quality potting shed. 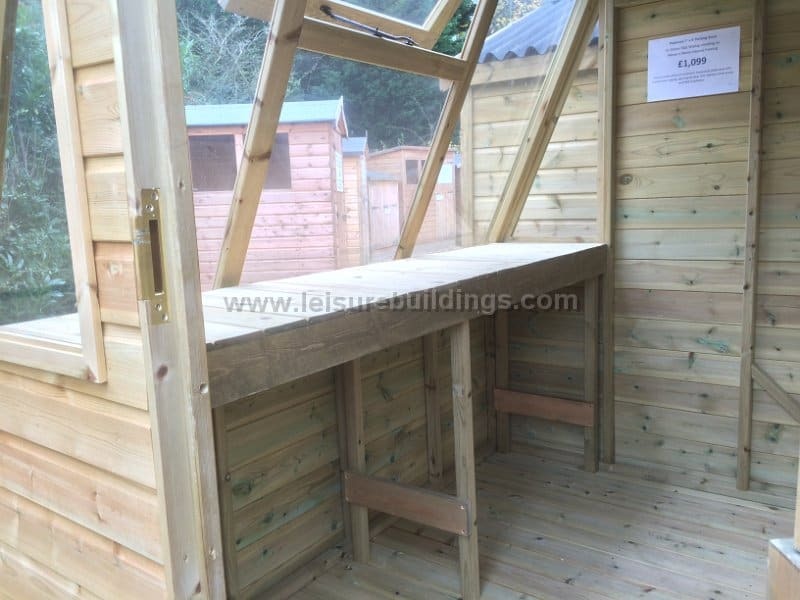 Assembly: All our traditional potting garden sheds are fitted FREE of charge, provided you provide a solid level concrete, paving slab base, timber decked area or possibly could be built on your timber bearers. Optionally, we have an option for building a timber raft for you. This potting sheds are secured using screws for ease of taking it down again if you decide to move. Delivery: Delivery is FREE to most of England (mainland). 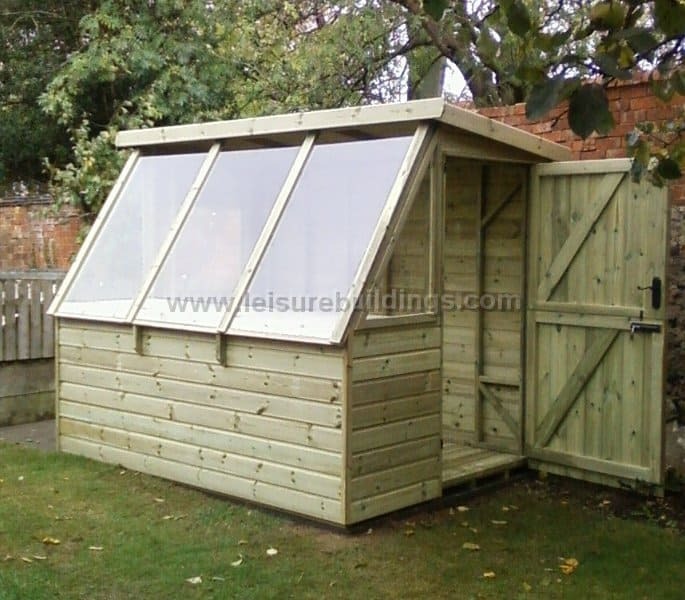 Outside of this free delivery area it is often possible to deliver and erect these solar potting sheds for a small surcharge. Sizes: Unless specified as finished size then sizes quoted are before machining which reduces the size quoted by about 3mm. BEWARE. Many solar potting shed manufacturers quote BEFORE machining sizes making them APPEAR larger – don’t be fooled.